I was late getting to the start line. Very late. Tables and chairs had already been stacked up underneath tents. The last empty gel packets and banana peels had been picked up and thrown into the garbage bags, which were already at the curbside ready for the cleaning crew to pick up. There were still a couple of course stewards milling around, though. Yes, I could run, they said, but the course would be closing soon. Very quickly, the light started to go and dusk started to set in. At the side of the road, a crying woman, who had apparently lost her dog down a hole, implored me to stop and help, which of course I did. But by the time the dog came out, it was night. I pressed on, now in total darkness, knowing that the course was closed and wondering whether I would ever get to the finish line. I imagine every runner who has ever run in an organized race has had an anxiety dream that went something like this. This particular one, dreamed on the Friday night before the Vermont City Marathon, was not my first, and I have the sneaking suspicion it won’t be my last. But despite of, or perhaps because of, this dream, rather than feeling agitated and anxious about the race I was about to run, I felt calm and centered. It was a strange feeling, and one I had never experienced before. And it had nothing to do with confidence. For the second time in the training cycle, I had a week interrupted through illness. Right after The Flower City Half Marathon, exhaustion from that race and the stomach bug I had been fighting that weekend decided to get together and have a little party in my body, resulting in a personal day from work and twenty lost miles of training during the highest mileage week of the whole program. So I had spent the last three weeks of training wondering–as I had done a year earlier–if I had done enough to avoid crashing and burning. As I had done a year earlier. The calm, centered feeling lasted throughout the Saturday carb load and into the night. Unusually for me, I slept well, and woke up focused and ready for the journey ahead. I made two tactical decisions in the week leading up to Burlington. The first was to run the race using a variation of the red light/yellow light/green light strategy that had always served me well at the Boilermaker. Dividing the race up into thirds, I decided to run the first nine miles at a comfortable pace, the second nine a little harder (with a short reprieve for the Battery Hill around mile fifteen), and the final eight with whatever I had left in me. This was a big change for me: Toronto and the first Burlington I ran however I could; New Jersey, Rochester and Niagara Falls (sort of), I ran with pace groups. Now I was going to run the race my way but with a predetermined plan. Catching up with the 3:45 pace group was going to be my goal for the first nine. Moving ahead of them and running 8:30 minute miles was the goal for the rest of the race. The second tactic, based on the the possibility that one of the reasons I crashed and burned last year was poor hydration, was to pull over to the side after every hydration stop and make sure all the fluid got into my body–not on the ground or down my shirt or wherever else it might go. 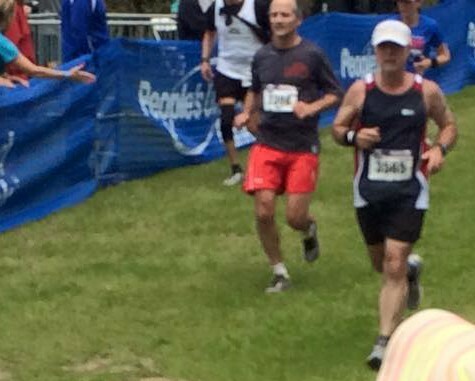 The thinking was that the benefits from properly hydrating throughout the race would more than outweigh the fifteen or twenty seconds I would lose by stopping and drinking. Like the Flower City Half, I got a rough start. The first three miles were congested, and I immediately lost sight of the 3:45 group. But in hindsight, that was probably the best thing that could have happened. I was forced to run at my own pace, so I found my groove pretty quickly. By the time the pack spread out and we hit the Burlington Beltline, I was cruising nicely. Tessa and Livvy (the newest and, to date, the only four-legged member of Team Love Nugget) met me at mile nine, then it was time to up the work rate on the long southern Oakledge Park loop. Somewhere between mile eleven and twelve, I finally made contact with the 3:45 group, and moving comfortably at my yellow light pace, I passed them just before the halfway point. It was a great moment, and I took great satisfaction from pulling away from them far enough that I could no longer hear their banter. It was time to play cat and mouse. I moved comfortably through the next few miles. I had already made the decision not to crush Battery Hill, but the sound of the Taiko drummers at the foot of the hill was so energizing that I took the hill without even feeling it. Before I knew it, it was on to North Avenue and the section of the course that I was dreading. Thankfully, the cloud cover that had settled in over the last couple of hours had kept the temperatures down, and I was able to press on past the point where I had given up the year before. The 3:45 group passed me around mile seventeen, but not for long. I hung in with them and pressed ahead of them once more, but they were hard on my heels until we hit the bike path. They finally passed me for good around mile twenty three, and shortly after I had to pause and walk. Under most circumstances, I would have taken seeing them disappear into the distance and my decision to walk as signs of failure. But unlike last year, I noticed a huge difference in the way my body and brain were communicating. Neither were admitting defeat this time around–this was just my body saying that it needed a little breather. Rather than berating it for not doing its job, my brain gave it permission to rest for a few minutes. By mile twenty five, it was back to work, and not long after the cheers of the crowd at the finish line spurred me on to a strong finish in front of Tessa and Livvy. I had run a 3:46 marathon, almost six minutes faster than last year’s PR at Niagara Falls. It was short of my goal, a BQ time of 3:40, but incredibly satisfying anyway. As always, there was much to dissect over the traditional post-race burger and beer. My quads were hurting, and they continued to do so for several days after, seemingly negating all the work I had done in the gym over the winter. And I still didn’t quite have enough gas to make it down the Bike Path in one piece, even though I had planned and executed my best marathon so far on a difficult course that had beaten me once before. But as I started on my second pint, I decided to enjoy the day’s achievements and put the questions to one side for the time being. Soon enough, it would be time to start the training cycle all over again, with my sixth Boilermaker at the beginning and the once-in-a-lifetime experience of the Marine Corps Marathon at the end. This entry was posted in The Flat-Footed Fox and tagged Flower City Half Marathon (Rochester), half marathon, long-distance running, Vermont City Marathon (Burlington). Bookmark the permalink.